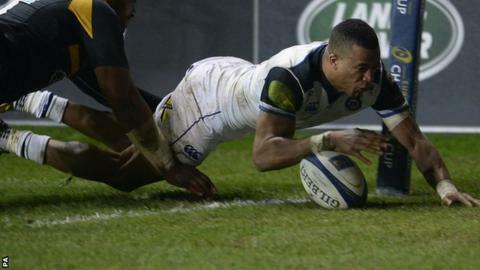 Anthony Watson's 85th-minute converted try secured Bath a dramatic win over Wasps in the European Champions Cup. With new England boss Eddie Jones watching, Rob Miller's try looked enough for Wasps after Jonathan Joseph and Matt Banahan crossed for Bath. But Wasps lost two men to the sin-bin in the final minutes as they tried to defend a five-point lead. Watson's score in the corner followed by George Ford's difficult conversion handed Bath victory. Pool Five leaders Wasps are now only two points ahead of Bath, who have played one game fewer, with reigning champions Toulon a further four points behind after their 24-9 win over Leinster. Despite outscoring the hosts three tries to one, Bath were not at their free-flowing best, and regularly relied on a belligerent rearguard to keep Wasps only metres away from the try-line. But it was the Wasps defence which was scrambling in the final minutes and, after losing Lorenzo Cittadini and George Smith to the sin-bin, Bath were able to take possession from an uncontested scrum and tee up Watson. Daly's day coming with England? Amid the drama, England head coach Jones, who also watched Exeter's tremendous win over Clermont Auvergne on Saturday, saw numerous Englishmen make cases to be included in his first squad in January. Joseph's try, after collecting a loose ball when Tom Ellis tackled Ruaridh Jackson, was a reminder of the centre's scintillating pace and expert finishing ability. Earlier, Banahan, who won the most recent of his 16 Test caps five years ago, combined tremendously with Nikola Matawalu to score after James Haskell had relinquished possession. Wasps' Elliot Daly stood out, enhancing his growing reputation and pressing his England claims. With Exeter's Henry Slade injured, there is an opening at centre for next year's Six Nations, and Daly's attacking verve and slick passing will make him a tempting alternative to Joseph in the number 13 shirt. The 23-year-old's well-timed pass enabled Miller to cross after countryman Joe Launchbury - excellent at lock - made ground through a gap down the other side of the pitch. Jones will also have left the Ricoh Arena with the image of England fly-half Ford showing the nerve to kick a conversion that grasped an unlikely victory for the visitors. Wasps: Miller; Tagicakibau, Daly, Jacobs, Piutau; Jackson, Simpson; Mullan, Johnson, Cooper-Woolley; Launchbury, Davies; Haskell, G. Smith, N. Hughes. Bath: Watson; Rokoduguni, Joseph, K. Eastmond, Banahan; Ford, Matawalu; Lahiff, Batty, Wilson; Ellis, Attwood; Garvey, Louw, Denton.